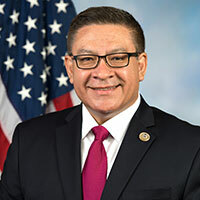 Congressman Salud Carbajal proudly represents the 24th Congressional District of California. The District includes the entirety of San Luis Obispo and Santa Barbara Counties, and a portion of Ventura County. Prior to representing the Central Coast in Congress, Salud served as Santa Barbara County’s First District Supervisor for twelve years. As County Supervisor, Salud championed the development of the Blue Ribbon Budget Task Force to examine our county operations and budget process. He has also advocated for health and social service safety net programs for our most vulnerable residents, co-sponsoring an initiative to provide health insurance for all the County’s children and spearheading the creation of a job skills and mentorship program for at-risk youth throughout the County. In Congress, Salud has demonstrated a strong commitment to protecting our natural environment and resources, enhancing public safety, creating economic opportunities, and working regionally to address our transportation, housing, and workforce challenges. A long-time advocate for our environment, Salud’s first act in Congress was the California Clean Coast Act which bans future offshore oil and gas drilling on California’s coast. He also is a member of the bi-partisan Climate Solutions Caucus, which works across the aisle toward developing strategies for mitigating the effects of climate change. Salud sits on both the House Committee on Armed Services and the House Committee on the Budget. Salud has used his role in the House Committee on Armed Services, to ensure the men and women serving in the military have the resources and support they need. Most recently, the Congressman has offered amendments in the National Defense Authorization act that would direct the Department of Defense to research the effects of climate change on military operations, develop educational partnerships between the Department of Defense and local colleges, and ensure female service members have adequate body armor suited to fit their needs. Salud served eight years in the United States Marine Corps Reserve, including active duty service during the Gulf War in 1992 where he was mobilized to Jacksonville, North Carolina. As a veteran, Carbajal has worked to ensure the needs of our nation’s veterans are met. He successfully secured $1 million for the Santa Barbara Veterans Treatment Courts and introduced legislation to combat veteran homelessness. Carbajal graduated from the University of California at Santa Barbara (UCSB) and also holds a Master’s Degree in Organizational Management from the Fielding University. Carbajal is married to Gina and they are proud parents of Natasha and Michael.